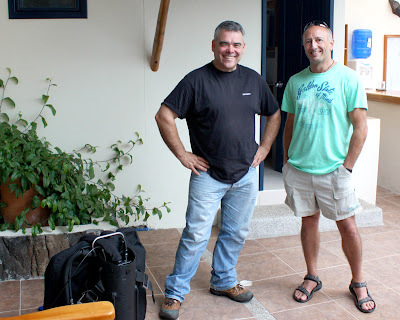 Galapagos Rebreathers: And so it begins… Welcome John and Frank! And so it begins… Welcome John and Frank! Today John Castracane and Frank Mcdermott arrived to our dive resort in Puerto Ayora. They are the first two people to arrive to Tip Top Diving from the 2013 Galapagos Rebreathers live-aboard trip. Everyone is very excited about this and units are being built already. We will be working on getting everything ready tomorrow and then doing a couple check dives on Wednesday. The trip starts on Monday but we expect to have everything loaded and ready to go by Sunday. I will do my best to keep this blog updated but can’t promise much. 14 CCRs aren’t easy to support and time will be really tight for the next week or so. You can follow this trip by using the Galapagos Rebreather Liveaboards 2013 tag.